Since 1973, Double L Group has been committed to providing high-quality products and services worldwide that are based on value, customer’s needs, and excellent sales support. We strive to provide our distributors and customers with innovative products with a great return on investment. Double L Group's Inlet product line creates a better environment for your animals with clean air and lower heating costs. Double L Stir Fans are important in your efforts to reduce fuel costs and temperature stratification by mixing the hot ceiling air with the cooler air on the floor, equalizing the temperature throughout the room and reducing dead spots. Double L Flooring provides comfort and optimizes your pig and poultry performance, creating the proper environment to develop to their full genetic potential for outstanding production. 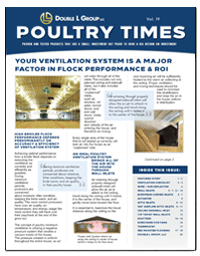 Check out the electronic edition of the 2019 Poultry Times! Learn about our CSW4612 Insulated Ceiling Sidewall Inlet, Wind/Sun Deflector, DirectAire Inlets, and more! Click on catalog to read industry articles and learn more about our poultry products. Check out the electronic edition of the 2018 Hog Gazette! Learn about our new Premier Nursery Floor, patented EcoTight Shutter, and DL Insulated Two-Way Inlets. 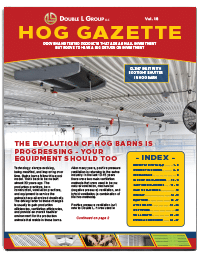 Click on catalog to check out our many swine products and read our industry article.